Come on Home (Neon Tetra Records : Out Now) is the brand new single from former BBC Scotland single of the week band The Filthy Tongues. It follows on from a remarkable twelve months for the band, that saw their single Holy Brothers (taken from the 2016 album Jacobs Ladder) named as a Single of the Week on BBC Scotland’s Janice Forsyth show. Back to Hell is a drippingly dark masterpiece from a band who were involved in the co-writing of four tracks on the latest Skids album. It takes us on a journey through the dank closes and stairwells of the Old Town in Edinburgh and all that goes with it. Delving deeper into the seething underbelly of the city with menace, gritty lyrics and claustrophobic soundscapes in spades. Repetitive blues-influenced grooves again form the bedrock around which edgy guitar, piano, organ and strings jag, stab and soar. Lyrically it’s as enigmatic and gritty as ever while Susannah Clark’s haunting strings bring even more to the feast. The Ghost of Rab McVie mourns the gentrification of Leith and good times/bad times gone. Mother’s Got A Knife, where the corrupt patriarchy gets its comeuppance, Carlos the Jackal and title track Back to Hell similarly continue the cinematic appeal of Jacob’s Ladder, just a rung or two higher. Think Bad Seeds in full swing or the soundtrack to a particularly tense Peaky Blinders climax. 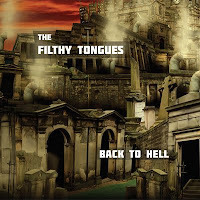 The Filthy Tongues have occupied a unique place at the heart of Scottish alternative rock, in various manifestations, since the mid 80’s. Martin Metcalfe, Fin Wilson and Derek Kelly were the core-members of Goodbye Mr Mackenzie, a stunning live band with Metcalfe resembling the MC of a debauched, vaguely gothic cabaret, which effortlessly churned out pop classics, sinister dark Blues and full-blown stadium-fitting anthems. The band regularly attract 5 star reviews and plays on BBC6 Music. The band also featured on the soundtrack to Skids frontman turned director, Richard Jobson’s New Town Killers film and caught the ear of Hollywood in David Mackenzie’s film Spread.